Description: 2K Sports released a new roster update for NBA 2K13 accurate as of January 24th 2013. The Cavaliers-Grizzlies trade were the sole focus of the latest update. The "Birdman" Chris Andersen has been moved from Free Agents to Heat's roster. In addition to this update, the Acrobat signature skill has been removed to prevent the NBA 2K13 tournament contestants from taking advantage of the reported exploit. The skill has been removed from 20+ players temporarily while 2K work on a fix / patch. 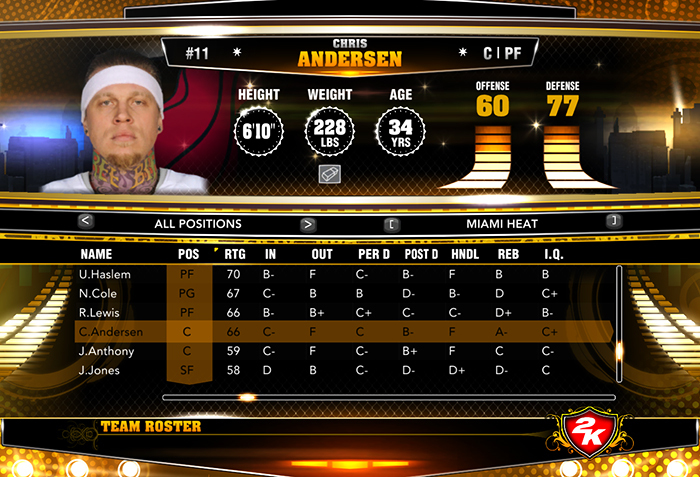 - Chris "Birdman" Andersen has been added to the Miami Heat's lineup with 66 overall rating. - The "Acrobat" signature skill has been removed temporarily from the following players: Andre Iguodala, Austin Rivers, Brandon Jennings, Brandon Knight, DJ Augustin, Damian Lillard, Derrick Rose, Dwyane Wade, Isaiah Thomas, Jeff Teague, Jerryd Bayless, John Wall, Kemba Walker, Kyrie Irving, Manu Ginobili, Marcus Thompson, Monta Ellis, Russell Westbrook, Tony Parker, & Tyreke Evans. - The Cleveland Cavaliers & Memphis Grizzlies trade has been implemented. - Jon Leuer has been added to Memphis Grizzlies' lineup with 63 overall rating. - Marreese Speights has been added to Cleveland Cavaliers' lineup with 70 overall rating. - Josh Selby has been added to Cleveland Cavaliers' lineup with 65 overall rating. - Wayne Ellington has been added to Cleveland Cavaliers' lineup with 64 overall rating. Unpack the files using WinRAR then copy the “Online Data” and “Saves” folder in to your NBA 2K13 Roaming folder. To find your NBA 2K13 roaming folder, open “Run” and type %Appdata% then open 2K Sports > NBA 2K13 folder. Watch the video tutorial below to learn more about installing the roster and online data files on PC.